MainJudaismChukat: Can You “Google” It? Chukat: Can You “Google” It? The power of paradox and mystery. The existentialist philosopher, Soren Kierkegaard, asked this question when contemplating the Akeda. He could not grasp how a benevolent God could command Abraham to sacrifice his son, Isaac. His question leads us to a confrontation with fundamental mystery and internal contradiction, with paradox. In the face of such an essential contradiction, we might consider how little we can ever truly “know”. When we consider the positive arc of human history, we trace a constant movement toward knowledge. As human beings, we desire to know everything, to understand. Those of us living in the midst of our technological age no longer simply desire to know everything; we believe it is our due to know everything. We believe we can know everything. But can we? Can we really know everything? But the mysteries inherent in our religious bearing mock the arrogance of thinking we can know everything. Indeed, there are times when it is worth wondering if we ever really know anything. Consider the parah adumah, the Red Heifer. Depicted by Chazal as the quintessential decree of the Torah (Chukat HaTorah), it stands beyond human comprehension. Think you can “know it”? Go ahead, Google it. You will find many entries but nothing that will satisfy anything deeper than a descriptive citation. At its foundation, the parah adumah is a paradox. It has no explanation that satisfies. The parah adumah was necessary to purify those who were tamei meis – contaminated as a result of coming into contact with the dead – yet those involved in almost any aspect of its preparation or ritual could not help but become likewise contaminated – tamei. It is, fundamentally, incomprehensible! The command itself is almost like viewing an Escher print, following its line leads us in contradictory circles! The very ritual and process commanded to purify cannot help but bring about the very contamination it purifies! To examine it, to “turn it over and over and over” is to feel drawn into a swirling current of confusion. Even Shlomo Hamelech, the wisest of all men, confessed in Kohelet, “I said I would be wise, but it is far from me.” Solomon claimed to have comprehended the entire Torah and yet parah adumah eluded his understanding. The Midrash teaches that God told Moshe, “…to you I will explain the paradox of parah adumah, but to every other human being I will always hide its mystery.” Only to the greatest of all the prophets was the paradox revealed; he had no need to “google” it! But for the rest of us it remains a mystery beyond comprehension. And what a mystery it is! Preparing and carrying the ashes of the Red Heifer are acts essential to this mitzvah, to a Godly command and yet the one fulfilling God’s command to “…take to you a completely red cow” cannot help but end up impure! How can it be that impurity can be the consequence of purity? It is mind-boggling, but no more so than the truth that a pure neshama can exist in an impure body. Or that the one who brings the Seir Hamishtaleach on Yom Kippur to attain atonement – to purify! – for the entire Jewish nation, must, by this act of atonement itself, become impure! We see this paradox in many facets of life. How many medicines, designed to heal, leave one with debilitating side effects? It defines our sacred history. Who was greater than King David? He fought more of God’s battles than any other Jewish warrior, defeating enemy after enemy. He purified the land promised to God’s Children and established the Kingdom of God. Yet, for all his efforts and victories, this greatest of kings could not build God’s Temple. That task would be left to his son, Shlomo. David’s hands, after a lifetime of purification campaigns, were left impure and bloodied. Damim rabim shafachta – Much blood did you spill! All his battles were driven by God. Indeed, the Zohar teaches that God’s name was etched in his sword. There was never a more righteous warrior! And yet it was the fighting itself which rendered him too impure to build the Beit Hamikdash! He battled for purity at God’s behest and yet his efforts resulted in impurity. Damim rabim shafachta! Can it be that in every tahara – in every act /action of purification – there is an inherent tuma – impurity? Can it be that purity is a necessity for impurity? The Maharal states that, hadavar mitpael meofcho - an entity reacts to its opposite. No purity without impurity. No achievement without failure. But why? Why must this be the case? Why, when we seek purity, when we perform the acts God commands to achieve that purity, we are rendered by the acts themselves impure? Of course, there is an “answer” to this paradox. But it is not one available to us. God deliberately has withheld the explanation. There is a reason but its explanation will remain a mystery until the days of the Messiah. The answer then is no answer at all. Google is useless here. Like Job, we are left without “answers” to the deepest questions and conundrums which bedevil us. Why is there illness? Tragedy? Why do good people suffer? We must always wrestle with the ultimate parah adumah question – tzadik v’rah lo, rasha v’tov lo, why do the righteous suffer and the wicked thrive? Klal Yisrael constantly confronts this very question. A single, lone country bombarded by thousands of rockets fired indiscriminately at civilians, towns and schools and yet, when Israel responds to defend its land and its citizens she is bombarded by accusations of evil and the terrorists lauded as the tzadikim! When exactly did this occur? On Friday of the week in which the parasha was, “This is the chok of the Torah (Chukat).” The yahrzeit of this tragedy is Erev Shabbos of Parshas Chukat. The Shibolei HaLeket states that some individuals fast on the Friday of Parshas Chukat as an atonement and memorial to that tragedy. But why, asks the Shibolei HaLeket, is the date of that terrible tragedy not preserved? Since when do we set fast day by its parsha rather than by its place on the calendar? We observe the 17th of Tamuz or the 9th of Av not the parashiot of those weeks. The Shibolei HaLeket relates that they asked the question in a dream and were told that the fast day commemorating this tragic event is to be related to Erev Shabbos of Parshas Chukat because this tragedy is connected to the reading Chukat itself. Why? Because who can possibly understand this paradox of good people learning Torah, committed to all that Torah represents, sacrificing on behalf of Torah, striving to be pure – and then having their Torahs burnt publicly by vicious haters and anti-Semites? This evil had nothing to do with a time and place. Last week, headlines announced that “Extremists threaten to burn Talmud, rip Israeli flag, at London march in Jewish neighborhood.” This is 2015, not 1244. It had everything to do with Parshas Chukat itself, which even Shlomo Hamelech couldn’t fathom. The lesson – not the answer! – is that there will always be things we cannot understand. Jews will be murdered. 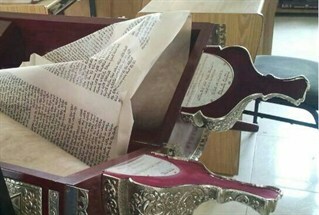 Sifrei Torah burnt. Communities destroyed. Families torn asunder. Good people brought to their knees. U.N. reports issued. We will not ever understand. So do not try. This fast is connected to Chukat.